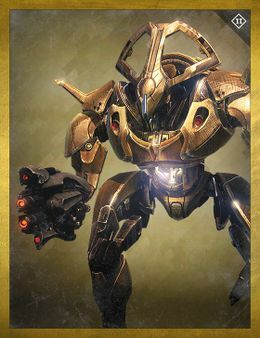 Overmind Minotaurs are a Vex Minotaur and boss enemy encountered in the Prison of Elders. Overmind Minotaurs are the servants of Qodron, Gate Lord and seek to ensure their master's enigmatic plan succeeds. In Challenge of the Elders, the Overmind Minotaur gains the ability to detain Guardians. These detainment fields must be destroyed or they will kill any Guardian trapped inside via suppression field.